If you go down to any St. Cloud hardware store, you’ll be able to find them. They are right there in the corner, somewhere on the rack that has all the ‘GARAGE SALE’ and ‘BEWARE OF DOG’ placards. They’re the ‘FOR SALE BY OWNER’ signs. They cost about $8.99 ($17.98 for two). Or, it is also possible to buy a couple of “For Sale by Owner” signs online for about the same price (although getting them delivered to St. Cloud might run extra). No matter which way you would get hold of the signs, you should be alerted to some possible extra costs. I don’t mean ‘shipping and handling’ charges you sometimes find tacked onto other offers. These are extras that have cost other sign purchasers thousands of dollars. Naturally, anyone who buys a ‘For Sale by Owner’ sign has decided to sell their St. Cloud house on their own rather than going with the crowd and listing through a St. Cloud Realtor®. The sign purchaser has probably made that decision for one of two reasons. The first is the less likely—namely, being convinced that he or she will do a better job. Selling your house without the specialized tools—the marketing connections, office backup, support of the professional real estate community—lacks most of the appeal of other Do-It-Yourself projects. Even just handling the technical details (hmmmm…where am I going to put the deposit money so it’s in escrow—or whatever they call it…). But those aren’t the most crucial ‘extra’ costs associated with those ‘For Sale by Owner’ signs. The extras are head-turning. The latest figures from the NAR show that the ultimate price paid for a FSBO home was $39,000 less than for agent-assisted sales (which typically sold for 98% of their listing prices). The reasons may be many—the most frequently cited being that real estate professionals are experts in attracting qualified buyers. It is, after all, what we do! Where Y=a total unknown, but it well might be as much or more that the cost of the car the sign buyer had been hoping to save. More seriously, though, only 8% of U.S. homes wind up being sold by owners acting alone. Something like 70% of homeowners who tried to sell their homes themselves eventually go with an agent. 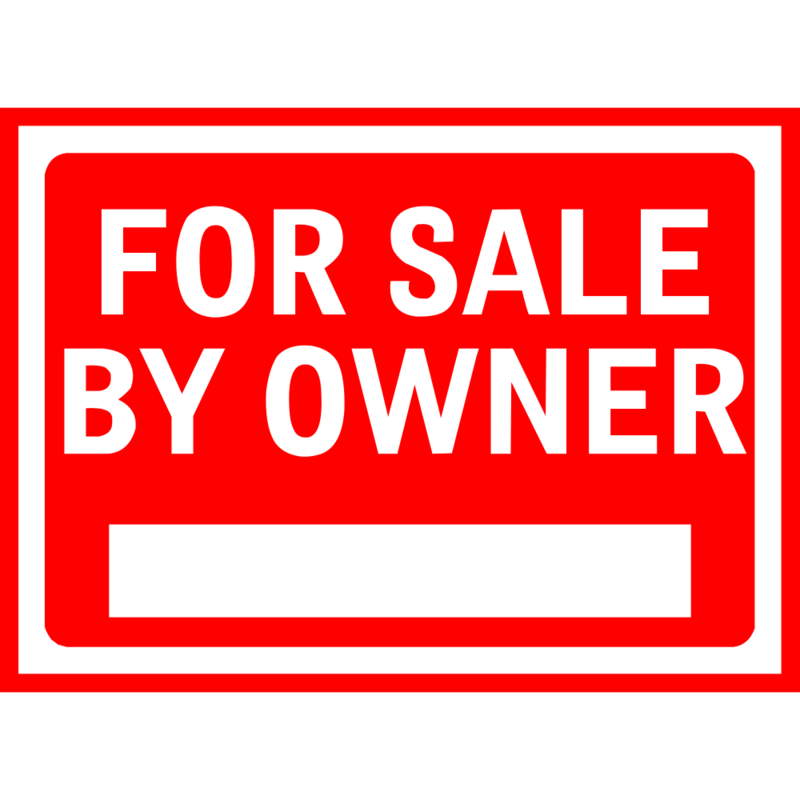 Then their outlay for ‘For Sale by Owner’ signs is a 100% loss (the hardware store won’t pay anything for the used ones). The good news is, you can avoid all those costs—hidden and otherwise. Just call me: I’ll provide the signs!